Thunder have live dates in Nottingham and Sheffield next week. 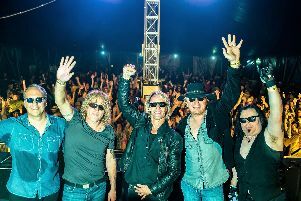 UK rock legends Thunder will be hitting Nottingham and Sheffield for live dates next week. They are at Nottingham Royal Concert Hall on Monday, February 15 and Sheffield Arena’s Steel Hall on Friday, February 19. Support will come from Terrorvision and King King. Thunder enjoyed a highly successful UK tour last year and lead singer Danny Bowes says they can’t wait to hit the road again. Terrorvision are also making a return to the live fold and touring with Thunder was offered them the ideal way to make a comeback.